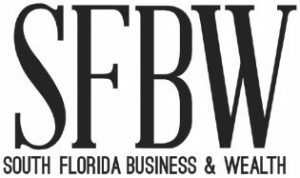 If I set the SFBW wayback machine to July 2014, there was an article about the groundbreaking for Solé Mia, the $4 billion development in North Miami, in 2014. Now, it’s coming to fruition. Residents are moving into The Shoreline, the first residential towers at the 184-acre master planned community. One of their key amenities is another topic covered by the SFBW wayback machine: South Florida’s first crystal lagoon. While the lakes at most properties in South Florida can be murky, the Crystal Lagoons technology uses a small amount of special chemicals that form a thin film on the top of the water, which prevents evaporation. It also keeps the water clean but without the massive amounts of chlorine that would be necessary for a swimming pool. The seven-acre lagoon Laguna Solé is the size of 21 Olympic-sized pools and will have sandy beaches. Residents can swim, paddleboard and kayak or float on luxury loungers. Laguna Solé also has gently sloping beaches and a shallow area nestled next to a palm-fringed island with plenty of floats to play on, the developer says. Other amenities include two multi-purpose resident lounges, a pet-grooming area, a game room, 24/7 concierge services, a business center, parcel lockers with 24/7 access, electric-car charging stations, a bike-repair room and storage, as well as ample resident and guest covered parking, a press release said. Private storage spaces are also available. There are also outdoor fitness trails. The Shoreline is offering studio, one, two, and three-bedroom rentals from $1,700 to $3,700. The Shoreline was designed by South Florida’s Arquitectonica and Robert M. Swedroe Architects. It has two 17-story towers with curves and soft lines that feature open floor plans, floor-to-ceiling windows, large bathrooms and expansive balconies. 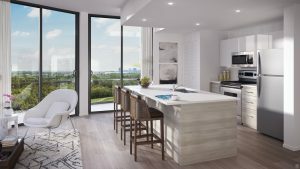 Among the views for residents are Laguna Solé, Oleta River State Park, Biscayne Bay, the Atlantic Ocean and the Miami skyline. 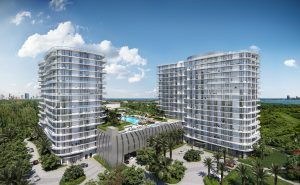 Jackie and Jeffrey Sofer, known for ownership of Turnberry, the Fontainebleau and Aventura Mall have also been involved in the project. 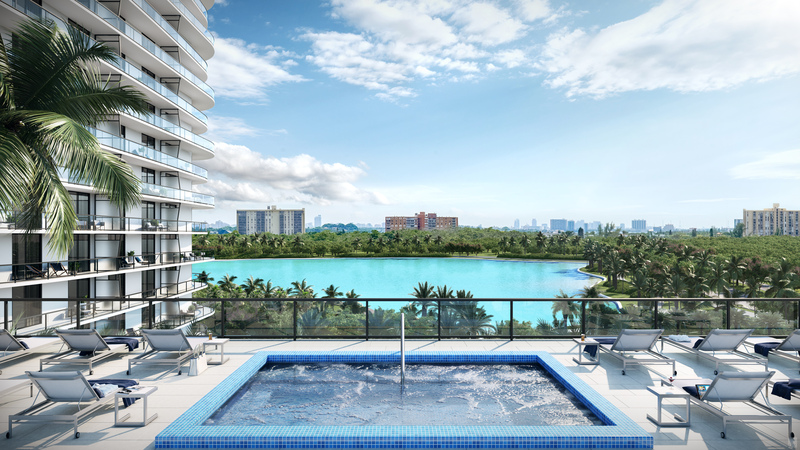 The Shoreline is just the beginning of the residential boom at Solé Miami, which will have 4,000 residential units. Moreover, there will a village created with 1.5 million square feet of commercial space.